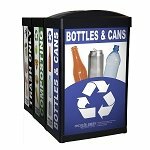 Enhance your recycling and trash program with eye catching display panels. 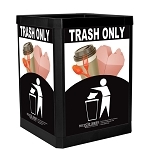 Use our bright, vibrant stock panels that come standard, or customize with your own graphics. 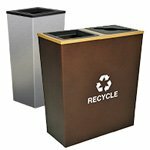 Perfect for towns, stadiums, parks and more, the ErgoCan Collection will help keep your space clean and promote recycling in an attractive way. 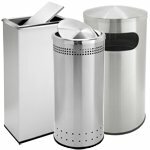 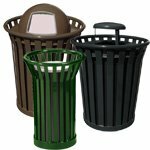 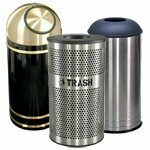 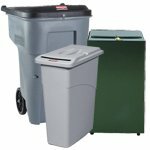 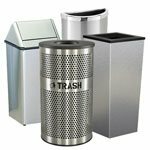 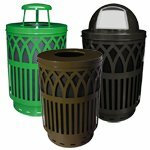 The ErgoCan Collection offers a fully-customizable trash and recycling collection system. 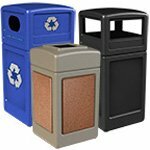 Community centers, businesses, restaurants, colleges, and parks all use ErgoCan's receptacles. 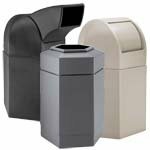 The mix of sustainability, ergonomic comfort, versatility, and style make ErgoCan an attractive option for large or small organizations. 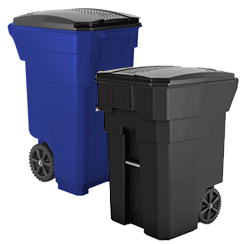 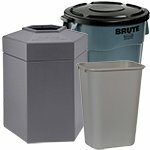 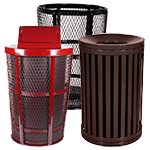 Choose from a range of container sizes depending on how much trash and recycling your organization collects. 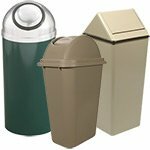 Choose among lid types for each container depending what types of materials you are collecting. 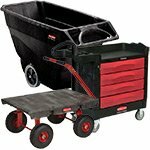 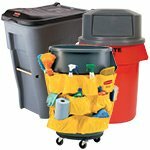 Optional snap on casters makes bins and containers easy to move. 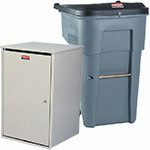 Or choose base connectors to join your individual containers into a complete system. 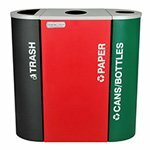 Spread your message with fully customizable, snap on side panels. 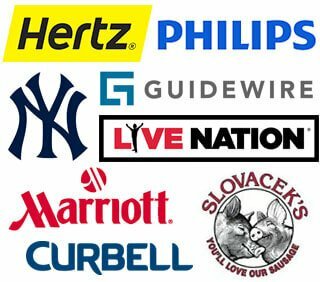 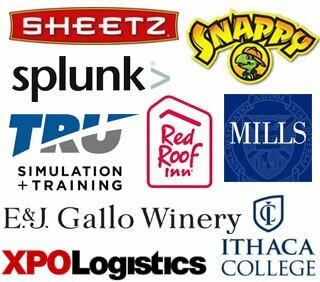 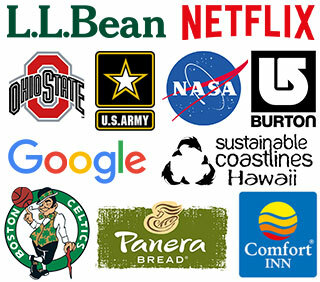 Customers choose among stock labels or may commission their own design to coordinate with existing branding and decorations. 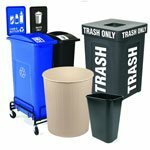 All these options result in a fully-customized recycling system that suits the specific needs of any school, business, or organization. 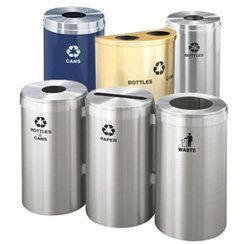 In addition, ErgoCan's are a sustainable product. 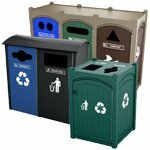 Continue reading to learn more about how to create your brand's custom recycling and trash center. 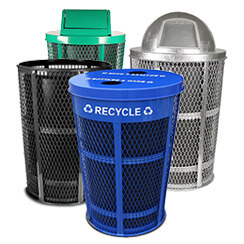 You promote environmentally-friendly behavior by offering conveniently located recycling and trash centers. 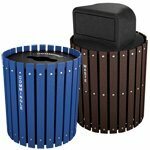 Why not take it a step further? 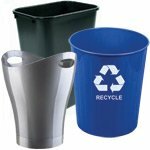 ErgoCan is proudly manufactured in the USA using 100% recycled Polypropylene (PP) plastic. 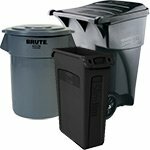 The black liner trash bags also contain 80-90% recycled material. 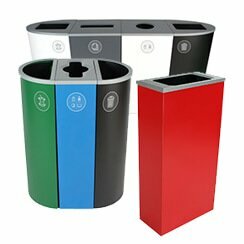 ErgoCan's sleek and ergonomic design fits snugly against a wall, under the counter, or conveniently near busy walkways. 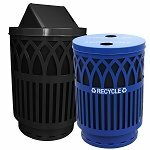 Choose from the 30 gallon, 45 gallon, or 60 gallon sized containers. 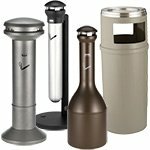 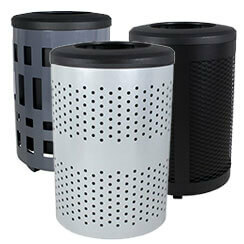 These indoor or outdoor containers fit a range of needs for the office, kitchen, or outdoor spaces. 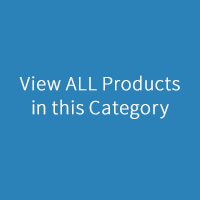 Safety and convenience are essential to ErgoCan's design. 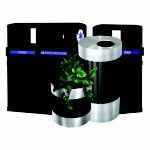 Staff easily change the inner bag through the side door. 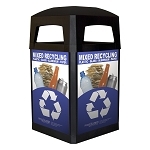 The ErgoCan proprietary bags are specially designed to make use of 98% of the bag. 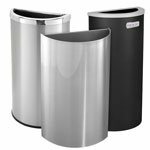 Everything about ErgoCan is attractive and efficient. 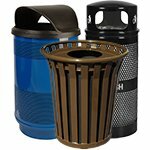 ErgoCan's lid-lock feature looks the bag in so it doesn't fall into the can. 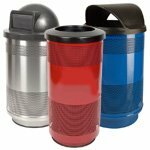 Your container always looks neat and clean since the lid-lock keeps the bag concealed from public eyes. 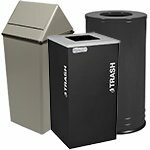 Our base connector system allows you to connect as many trash and recycling cans as you need. 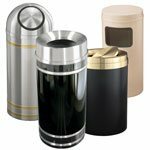 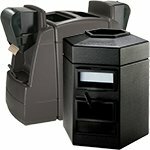 Choose among different five lid styles for various purposes including Single Stream, Rectangular, Round, Paper Slot, or Diamond. 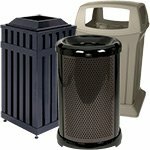 The components allow you to choose the right set for your needs. 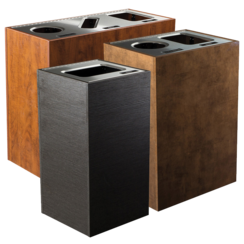 These choices allow user's to adapt the system to individual needs or even specific rooms. 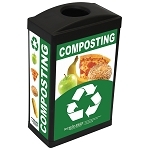 For example, the employee break room in an office may include a small compost, trash, mixed, and bottles and cans. 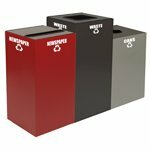 While the office cubical recycling system may include paper, mixed, and waste. 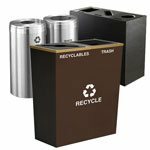 Both systems feature custom signage labeling the correct materials for each container and reinforcing the company's branding or office decor. 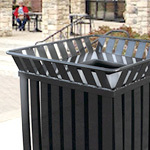 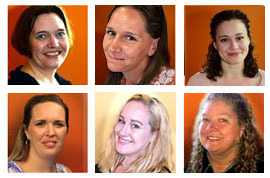 Many organizations customize the look of their ErgoCan system. 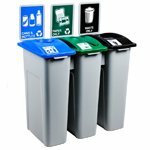 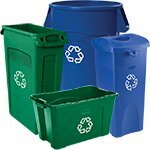 Your business or organization is unique, so shouldn't your trash or recycling program also be special? 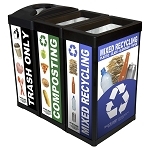 ErgoCan containers have four panels for your custom-printed signage. 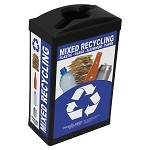 Create your own eye-catching labels that coordinate with your brand identity. 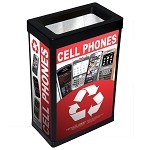 Customers may order through their favorite print and sign shop or through us. 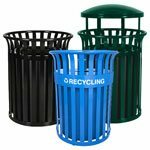 A custom recycling and trash system is a reasonably priced way to reinforce brand identity and values. 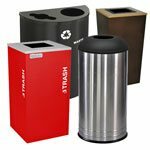 Impress your customers, employees, and guests with a convenient reminder that you care about the earth and the hygiene of your establishment. 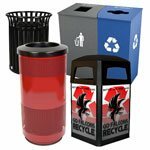 ErgoCan offers comprehensive and custom-made system whether your recycling needs include compost, paper, cans, electronics or glass. 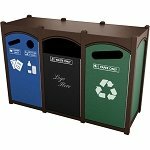 Recycle with style using the ErgoCan collection.